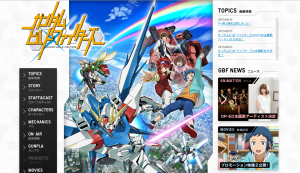 Gundam Build Fighters TV Anime OP “ニブンノイチ” and Gundam Breaker (Playstation Vita) OP “INFINITY” by BACK-ON! It’s official! BACK-ON has been announced as the performers of the opening theme “ニブンノイチ” (Nibun no Ichi) for the upcoming anime Gundam Build Fighters! With props to MONSTERSNITE for the news, the anime is due to première on TV Tokyo on October 7th 2013. The announcement coincides with BACK-ON‘s first upcoming single release in 2013, titled ニブンノイチ / INFINITY (Nibun no Ichi / INFINITY), which is due out in November. The band’s official website revealed that the second ‘A’ track of the single, “INFINITY“, will also be an opening theme, but for the Playstation Vita version of the game Gundam Breakers, which an updated version of the original PS3 game, and is set to be released on October 31st 2013. If this news is to be believed (not yet officially confirmed), then the inclusion of instrumentals is a great step for fans who (like moi) love mashups – the availability of a good instrumental hopefully opens the door for more of BACK-ON‘s work to feature in remixes of the future. Regardless, I am sure you are just as excited as I am about these announcements; as the saying goes – you wait all day for a bus or a train and then three come along at once. This is the band’s first group CD release since May 2012 (that’s a year and a half ago!) – during which time BACK-ON have packed in a multitude of live performances in Japan; KENJI03 became a father and a solo artist (see 雨のち晴れ collaboration with 菅谷哲也); and the band has guest-written songs for other artists (see Hands Up!) – and now we suddenly have a new single, big name anime and game tie-ins, and also that BACK-ON will be in the Americas! Yup, I kid you not! More details to follow, but the key venues to catch them are at AnimeUSA (September 13-15th 2013) and PMX (Pacific Media Expo) (November 8th 2013). Feel free to join this forum thread for the latest updates. And we at BOO will continue to keep an eye out for new updates, so please do keep checking back! Let us know in the comments or on the Forums about your thoughts! p/s: It might interest you to know, if I have interpreted the dictionary correctly, that ニブンノイチ (Nibun no Ichi) means ‘one half’. BACK-ON releases ニブ­ンノイチ/INFINITY PV Preview! BACK-ON’s new single “ニブンノイチ / INFINITY” due out on November 6th 2013! BACK-ON to appear at Pacific Media Expo 2013, Los Angeles, this weekend!